1 review of A Piece of Cake Catering, first by ZHoughtelin. Our wedding was going to be in Colorado Springs and I wanted to make sure we had AMAZING food for our guests! After interviewing several, I was beginning to feel like this was going to be never-ending and finally, I came across A Piece of Cake Catering. The owner Jason made an appointment with me almost immediately and set up a tasting. My sister, who was to be my matron of honor, came with me to scope things out. OMG was the food delicious and his cupcakes are to die for! After meeting him, getting to know him and tasting the dishes he prepared for us, I was sold. I reserved his services for our big day during the meeting and before we left, we had the entire menu picked out. He is extremely professional, laid back and super accommodating. I have a niece with Celiac and he helped me pick out a menu that was healthy, delicious and mostly gluten free. A Piece of Cake Catering grilled everything on-site for us and provided 2 gentlemen who were courteous and an extreme pleasure to work with. We had several appetizers, 3 meats grilled on site, several sides, salads, an edible arrangement made by Jason himself, and cupcakes (we went with the strawberry champagne and the carrot cake cupcakes). Jason made sure all the colors matched our wedding colors and everything looked beautiful! To show how great the food is, we had food for 10 extra people and enough cupcakes for everyone there to have more than 2; almost no food was left! The food and cupcakes were all gone by the end of the evening. Everyone was satiated and happy :-) AND, on top of everything, he also took care of all the rentals we needed for the day. I would definitely recommend A Piece of Cake Catering for ANY catered event. THANK YOU for helping make our day that much more incredible! Do you own A Piece of Cake Catering? Contact us to connect with your diners. 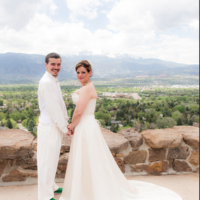 A Piece of Cake Catering is located near the cities of Colo Spgs and Broadmoor. People found this by searching for: A Piece Of Cake Catering Colorado Springs, Reviews A Piece Of Cake Colorado Springs, A Piece Of Cake Colorado Springs, Coloradoapieceofcake.Com, Caterers Colorado Springs, A Piece Of Cake Catering Colorado, A Piece Of Cake Catering, Piece Of Cake In Colorado Springs, and A Piece Of Cake Catering Co.